Once upon a time, the combination of a dream of one author and the genealogy research expertise of the other; ignited the storyline for Bloodlines – Touch Not the Cat. 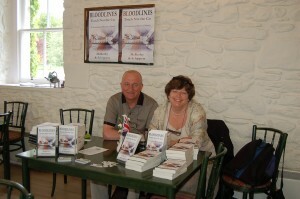 The success that has befallen the spiritual genealogy mystery novel since its publication was awarded June 5th 2012 with a very special event at the main location of the novel: Ballindalloch Castle. At the invitation of the current Lady Laird; Clare Macpherson-Grant Russell, the fictional inhabitants of the Ballindalloch Estate and their authors were welcomed in the charming castle tearoom. As an extra wonderful surprise, the passengers of the famous ‘Royal Scotsman Train Journey’, that includes Ballindalloch Castle in its excursion program, visited the event. 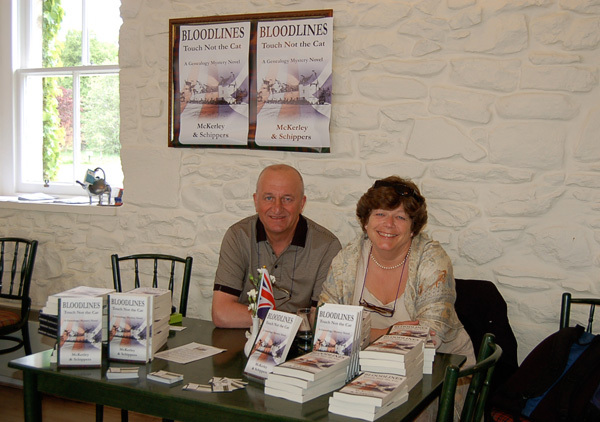 Among the passengers was Arts and Travel writer Vivien Devlin, who shared her views on inspirational train journeys and talked to the authors about the sequel: Bloodlines – Traces, they are currently working on. “What could be more appropriate”, Viv Devlin said “than to follow in the footsteps of Agatha Christie and have a murder or mystery on board the Orient Express Royal Scotsman train”.